Take Action Now: Oppose Red Flag Laws Support Constitutional Carry Expansion Stand-Your-Ground Shop for Gear Donate Join Today! What are they saying about the ISAA? Help Us Share the Flyer for the Rally! 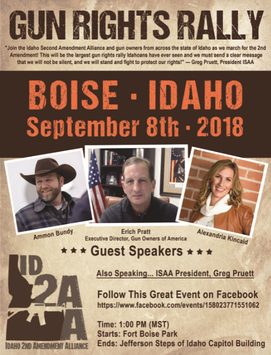 With the primary season now behind us, we turn our attention to the largest pro-gun rally this state is ever going to see. With incredible guest speakers lined up to speak for us, we need to spread the word about this important day. In 2016 we marched over 1,000 Idahoans to the capitol and passed Constitutional Carry! Now we are shooting for 5,000 Idahoans marching with us for the 2nd Amendment, and your help is greatly needed. >>> First, we need you to share our flyer that contains all the important details of the rally. >>> Second, in order to reach thousands of people we need to advertise – a lot. Please consider helping us reach more Idahoans by donating $100, $50, or $25 today! If that is simply too much right now, then please consider a smaller donation of $10 or even just $5 to help us reach more Idahoans. >>> Finally, please make sure to use our Facebook event link to invite as many Idahoans as you can to this event. If you are not on Facebook, then please forward this email to as many people as you can in your contact list. With Michael Bloomberg and his gun control cronies fighting us right here in Idaho, the time is now to take a stand against them. If you aren’t in this fight, then we need you to be! We need many more citizens mobilized to defend the 2nd Amendment in Idaho. Remember that just this year we had over 30 legislators vote for gun control from both parties. It takes a massive grassroots army to send a powerful message that we will not put up with gun control voting legislators. Having 5,000 Idaho gun owners marching on the capitol will send a very clear message that we are here to stay, and we are watching our elected officials intently. Gun owners tossed 30-year incumbent Chairman Tom Loertscher from office for blocking pro-gun legislation, and they will toss more legislators who stand in the way of gun rights. We are asking all Idahoans to make the trip to Boise. Save money. Carpool. Do whatever you can to be in Boise on September 8th! Don’t let Idaho turn into the next Oregon, Washington, or Colorado. This is your fight and we appreciate you getting involved! From The Board Of The ISAA, Happy Memorial Day! Idaho 2nd Amendment Alliance is a non-profit advocacy organization registered with the Idaho Secretary of State. Contributions or gifts to ISAA are not tax deductible for IRS purposes.